Looking at all of Virgil Marquart’s photo’s (and in this case a postcard), I am often transported back in time to places that meant the world to me. Case in point – the Allen County Public Library. This particular shot was taken (I'm guessing?) sometime in the late 60's/early 70's. I’m sure it had to be either very early in the morning and/or sometime early on a Sunday. There’s not any cars sitting in traffic and if you look at the streets that run parallel and adjacent to the library, you won’t find the cars that typically decorated each side of the library. As I said in a previous post, I spent a lot of time at this library because my mother went through a phase where she did a lot of research on our family tree. My mother became pretty familiar with the traffic pattern of the patrons which was important because parking near the library was almost impossible. You see, back in the 70’s, there were actually a lot of buildings located around the library – Webster Street, Berry Street, Wayne Street, Washington Avenue, Jefferson Avenue – all had numerous buildings. There was parking around the perimeter of the library – meter parking. I was a frequent meter feeder – nickels and dimes and at one time – I’m thinking even pennies. That was the preferred place to park because if we were there after the sun went down, my mom always felt safer if we didn’t have to walk very far. Located down the street was a parking lot where you had to pay to park on nice, black pavement. We never, ever took our chances with parking illegally (either in one of these lots or in the lots of businesses) because the police were frequent ticketers of downtown parkers. As you all know, the library underwent a complete overhaul and expansion. I did visit it last summer and even though I was impressed with its grandness and new technology gadgets, it felt a little stiff and formal. With time and more visits, I'm sure I'll get used to the changes. In the meantime, I have my memories. I have my Virgil Marquart postcard. We were lucky (and thrilled) to be married in Fort Wayne - 19 years ago today. Married at the Cathedral of the Immaculate Conception by Monsignor Lester. Reception at the Fort Wayne Chamber of Commerce. Photography by Michael's. Cake by Richard's Bakery. Flower's made by a friend of the family - purchased locally. Additional flower's purchased at Moring's Flowers and Gifts. Catering from a local group (name escapes me). My wedding dress and the bridesmaid dresses were purchased from some place downtown - name escapes me - will need to dig through my stuff to find that one out. Tuxes rented locally. Horse and carriage (later switched out to a limo because of lightening) provided by local company. Can you tell? I loved relying on local businesses to help me with all of the details of my wedding. No chains - with the exception of the Tux people - were a part of my wedding. 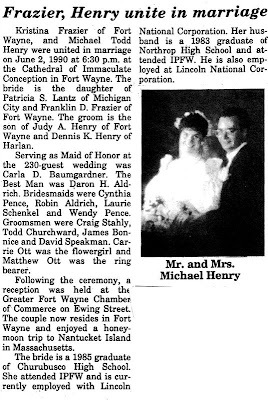 I wonder if couples getting married now in Fort Wayne - still use local businesses for their happy day. Oh - and happy 19 years to my loving husband. I couldn't believe that I still had this. It was tucked away in a very old book that had stayed in my grandparents house when my mom moved us to Kentucky. Good thing too. 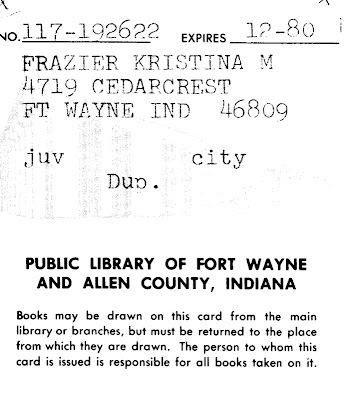 This little piece of barely-stiff paper (otherwise known as an Allen County Public Library card) would have never survived a fire. Looking at this card (yes - even if it is a "Dup.") brings back lots of memories for me. Even though we lived in Waynedale - we spent a great deal of time downtown at "the" library. While my mom spent hours and hours in the basement (or wherever it was), researching our family tree, I would lose track of time, sitting in between the aisles and aisles of books and shelves. It was my own personal "think" ground. I'd go off in search of a book (maybe the latest Judy Blume?) and end up with that and then a dozen others that were completely unrelated. 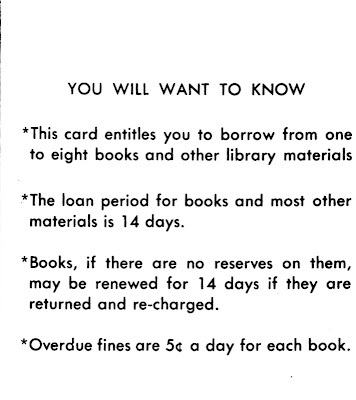 Can you believe that fines were only 5 cents? Or that you could check out eight items at a time? Seems forever ago, doesn't it?